3 tablespoons finely diced sun-dried tomatoes without oil. Red bell pepper can be used as a substitute. Thinly slice the cucumbers lengthwise. A mandolin makes slicing easier. If you don’t have, use a vegetable peeler. The slices need to be thin enough to roll-up. Pat dry all the slices with paper towel to remove any excess water. Set aside on a cutting board. Combine feta and yogurt in a bowl. Use a fork to mash the ingredients to a paste like consistency. Add the sun-dried tomatoes, olives, oregano, lemon juice and pepper. Stir well. Place 1-2 teaspoons of mixture at one end of the cucumber slice and roll up. Secure with a toothpick. Continue with remaining slices. Chill until ready to serve. Best to serve within 1-2 hours for maximum freshness and to ensure cucumber slices remain crisp. 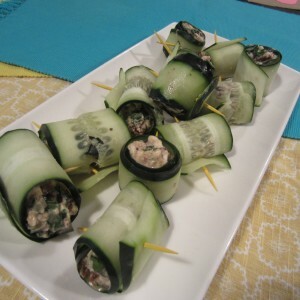 Depending on thickness of cucumber slices, this recipe yields about 18 roll-ups.